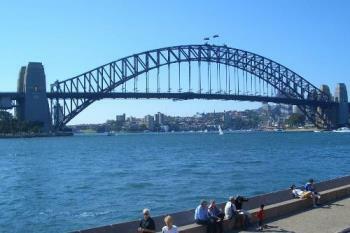 I would like to do the Sydney Harbour Bridge Walk, but have a fear of heights! No good doing it if my eyes are going to be closed. lol Has anyone achieved something that has involved heights and have faced that fear? I am hoping to be able to achieve this ossie, but it is not going to be an easy task of course, and I also want to do it without my eyes closed otherwise it is no point! lol Thank-you for your response. Acrophobia is simply a severe fear of heights. Now being afraid of heights is a common and sometimes appropriate feeling. But the phobia part kicks in when you feel afraid in a safe environment such as inside a skyscraper. Acrophobia is treated with graded exposure therapy. http://www.abc.net.au/dimensions/dimensions_health/Transcripts/s821855.htm Check out this link, it is connected with a reporter who climed the Sydney Harbour Bridge. Thank-you for sharing that with me Elusive Butterfly, now it is just up to me! I have the same fear. My husband wanted to check out Ausable Chasm and we walked across the bridge together. I was white knuckled and my face was filled with terror. Now that sounds like the type of thing that I would go through, but what an amazing feeling after you have achieved it! If I did this walk, I would hope my fear will have disappeared. I am really really scared of heights, but awhile ago we went to luna park in melbourne and i went on the mad mouse, now that was scary we were up pretty high and of course going down the hills so fast i was screaming but i felt so good afterwards i was on a natural high! Once it is achieved, the feeling afterwards is always good! Thank-you for your response baysmummy. Hummm got me there. I went to the Grand Canyon, and my legs were like jello at the cliffs edge. I just held onto my hubby's hand, and did it slow. I prayed first. Glad you were able to do it margieanne and thank-you for your response. Nice to hear, thank-you for your response. That is great vincent, thank-you for your response. I did. But it has to walk the distance forth and back. What I mean is, you walk through the first time looking aside and a little down, not directly down but to a distance. Then in order to see the whole aspect you have to pass again omn the other side. Try it. I did it and it worked for me! Will give it a try remaster, anything to get over this phobia. Thank-you for your response. I'm not too bad with heights, although as I have got older the fear is increasing for some reason. I have bungee jumped x 2 and hot air ballooned. My real fear was of water (as I am not such a good swimmer) but I was convinced to try scuba diving by my husband and loved it. I had about 6 dives before we moved house and didn't get the chance tto do it again. I don't think I would be fit enough to do it now, but at least I faced my fear. Thank-you for sharing that missy, especially the water fear! I have been like that from childhood, (nearly drowned) and in my day there wasn't what they have now! I would love to go scuba diving so see there is hope for me yet! I shall conquer all my fears, well I will at least try! Thank-you for your response, holding someones hand will be the way to go, as long as I can keep my eyes open! Luckily not as yet! But have wittnessed people fear hights!! Not funny for them! hi caramello, i'm not too bad with heights, just don't like going to close to the edge is what freaks me out! Hi peizli, I think looking down does it for me, but the point of doing this walk is the scenery, so hope the fear will soon be gone!